Sydney, Sep 13, 2012 (Global Fashion Wire) - Emerging Australian Label 'Me & Zozo' is debuting their first ready-to-wear range of Kaftans (Spring/Summer 2012/13) at Creatives Uncovered. Inspired by the many colours of the earths exquisite forms of Fauna & Flora 'Me & Zozo' balances and incorporates a refreshing palette of gold, black, green, blue, yellow, lilac and pink entwined within the Animal and Floral Prints. 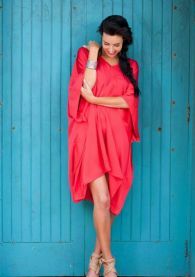 'Me & Zozo' is a collection of Kaftans using vibrant prints and various silhouettes designed and made here in Australia using silk, crepe de chine silk and chiffon. These Kaftans are designed to embrace the female body, to allow one to feel comfortable, womanly, elegant, admired yet playful and easy to wear whilst adding a little bit of excitement to ones day. 'Me & Zozo' is currently stocked and available through their online website, Me & Zozo Facebook or by contacting them directly. So whether it is by sandy shore, lunching on the weekend with friends, sipping on cocktails whilst watching the sun slowly set the 'Me & Zozo' collection is created for every woman.